Download our free, industry-first smartphone application for product and technical support information in the field. 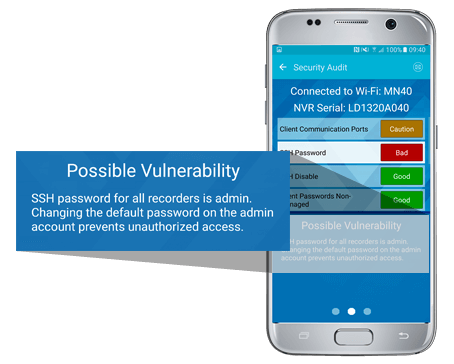 Strengthen cybersecurity by auditing the configuration of installed March Networks recorders. Get a list of recommendations to harden the installation. 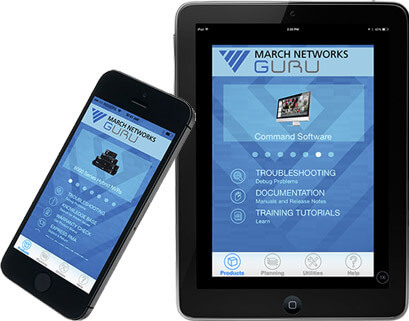 Download GURU onto your iPhone, iPad or Android device for instant access to an interactive knowledge database for March Networks products. Troubleshoot and solve issues faster in the field with GURU’s advanced diagnostics and support tools. Just find the product you’re working with and scroll down for documentation, support tips, video tutorials and more. Search known issues or use GURU’s smart symptom filtering to quickly pinpoint problems. You can also submit a technical support ticket, check product warranty or Return Material Authorization (RMA) shipment status to speed service calls and find answers faster. How secure is your video surveillance installation? Find out with our GURU app’s new Security Audit feature. This convenient new tool analyzes how secure the configuration of installed March Networks recorders is against a list of potential weaknesses. It then recommends ways to harden the system, such as changing a default password. Technicians can email the complete the list of recommendations to themselves, a supervisor or customer for future reference. Wirelessly provision our 8000 Series or RideSafe NVRs, or run installation reports for a snapshot of your system’s configuration details including camera resolution, bit rates and field of views. Transit operators can also trace the movement of mobile hard-drives following an incident with GURU’s Mobile Asset Tracking feature.